33 WINTER 2019 Coat check About 80 percent of Lions live on or near campus, but still, that wind isn't playing. Keeping it warm Clockwise from L: Leather, leather, leather. (Discussion over.) Wubby fleece jackets, camo over tie, grandpa sweater, bomber jacket. Who ' s in page 26: Genevieve Duran '20 and Ryan Soldati '20. page 27: Clockwise from L: James McAteer '19, Lucy Brice '19, and Tyler Hubbert '19. page 28: Clockwise from top L: Shirley Hecht '19, Emmy Liederman '21, Genevieve Duran '20, Maya Erdenberger '22. PAge 29: From L: Gino Pineda '19, Melissa Marshall '21, Antonio Gamboa '20, Shannon Deady '19. PAge 30: From L: Sydney Santiago '21, Tiffany Teves '21, Grace Zimmermann '21. PAge 31: From L: Dejon Ricketts '19, Aaron Conyer '19, Jabari Brown '19. 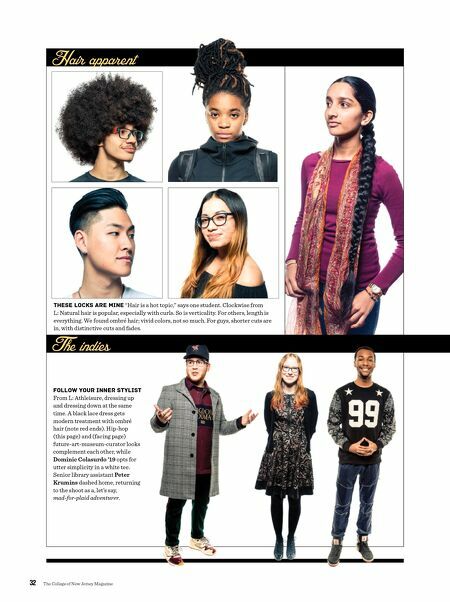 PAge 32: Hair: Clockwise from top L: Derek Tingle '22, Ayanna Sommers '20, Surya Ramesh '19, Yoselin Hernandez '22, Josh Lee '20. Indies: James McAteer '19, Emily Litwin '19, Kevyn Teape '19. 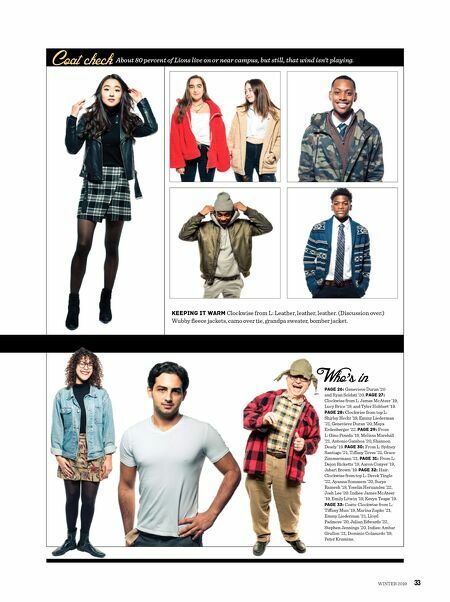 PAge 33: Coats: Clockwise from L: Tiffany Mun '19, Marina Zupko '21, Emmy Liederman '21, Lloyd Padmore '20, Julian Edwards '22, Stephen Jennings '20. Indies: Ambar Grullon '21, Dominic Colasurdo '19, Peter Krumins.